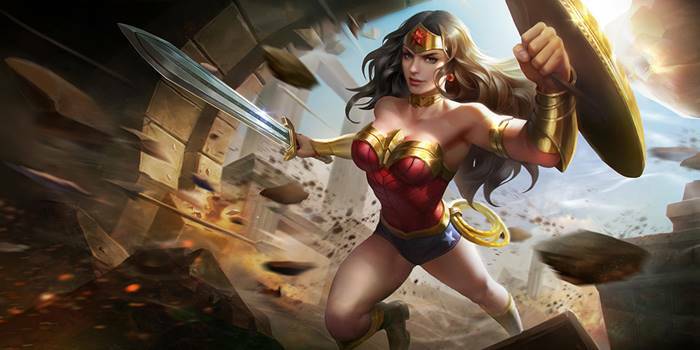 Guide for the hero Wonder Woman, a character in Arena of Valor (AoV). Included are Wonder Woman's abilities, statistics, attributes, strengths, weaknesses. After 2 normal attacks, Wonder Woman’s next normal attack will throw her shield, dealing an additional 84 (+6.4 each level) true damage to all enemies in its path and slowing their movement speed by 50% for 0.5 second. If the shield hits an enemy, Wonder woman will recover 10 (+7 each level) (+0.1 AD)ˀ HP. If the shield hits an enemy hero, the HP recovered is tripled. Wonder Woman repels her enemies with her sword and shield. Her shield bash deals 40/80/120/160/200/240 (+0.6 AD) (+5% of the target’s maximum HP) physical damage and slows enemy movement speed by 20% for 3 seconds. If the shield hits an enemy hero, Wonder Woman will receive 15/16/17/18/19/20% damage reduction for 3 seconds. Wonder Woman throws her Lasso of Truth around an enemy. If the enemy’s HP is greater than 50% of their maximum HP, then Wonder Woman will be pulled towards them, dealing 250/300/350/400/450/500 (+1.0 AD) physical damage. If the enemy’s HP is less than or equal to 50% of their maximum HP, then Wonder Woman will pull them towards her, dealing 250/300/350/400/450/500 (+1.0 AD) physical damage. If Wonder Woman hits an enemy with this ability, the cooldown will be reduced by 3 seconds. Targets hit are stunned for a short period of time. Lasso of Truth passes through walls and can hit enemies on the other side. Wonder Woman builds up her energy and then slams her bracelets together, unleashing an energy wave that deals 400/550/700 (+1.0 AD) physical damage to enemies in front of her and stunning them for 0.75 seconds. Wonder Woman and allies behind her receive shields that absorb 600/800/1000 (+12% of her own maximum HP) damage for 3 seconds. Wonder Woman also increases her movement speed by 50% for 1 second. While she is building energy, Wonder Woman will receive high amounts of damage reduction. “Damage reduction” activated during the ability is around 50%. Our recommended order for Wonder Woman’s abilities as she levels up. See all of Wonder Woman’s item builds.